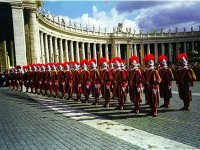 Yesterday the new group of Swiss Guards were sworn in at the Vatican. While reading about this event, I learned that they are now recruiting on Facebook. One of my nephews aspires to be a Swiss Guard, but we haven't quite figured out how to get him Swiss citizenship. Oh, well! Maybe he should talk to Michelle Bachmann to learn how it's done. In any case, bravo to the brave men who protect the pope.